BLOOD-SUCKING is painless, particularly when the leeches are clinging to inconspicious parts of your body, quietly drinking microscopic portions of your life fluid. It’s no big deal, really, considering the leech (smaller than a garden millipede) drains hardly a pin drop of your blood before it falls back into the bush. But if you can’t stand the sight of the creepy black thing on your urban-smooth skin, just dab Tiger Balm ointment on it and it will curl up and let go. On no account should you try to pluck out the critter because its fanged grip is so strong you will rip off a patch of your skin. Leeches aside, the true virgin rain forest is an enjoyable place to spend a slow weekend of boating, trekking, river-crossing, waterfall bathing, bird-watching and overnight camping. And the nearest patch of jungle open to city folks is the Endau-Rompin National Park, a half-day’s drive north from the concrete jungle of Singapore. This vast reserve – about 1.5 times the size of Singapore island – starts from the foot hills of Johor and stretches into the mountains of Pahang. 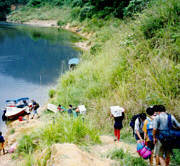 It is cut by the scenic Sungai Endau, a broad, fast-flowing river (mostly waist-deep) crisscrossed by rapids, hunchbacked boulders and waterfalls, and reminding you of movie scenes in Indiana Jones and the Temple of Doom. You sign up with a local adventure tour firm, and on Friday night, you join a group of 16 to 20 likeminded adventurers – in shorts, T-shirts and sports sandals – riding in a convoy of four Land Rovers and Jeeps from Johor Bahru to your first stop, Keluang. Your group checks into a hotel for one final night’s sleep on blissfully soft mattress and pillows, resume your journey early Saturday morning to the timber town of Kahang, eat your final meal in civilisation’s roadside kopitiam, and then veer off along a very bumpy dust-enshrouded track through a palm-oil plantation into a tiny settlement of Orang Asli (aborigines) at Kampung Peta, on the bank of the river. Getting down from your vehicle, you enter the nearby forest rangers' office to listen to a lecture of do's and don'ts in jungle living, watch a half-hour video on the pristine beauty of the Endau-Rompin park and collect your permit that authorises you to hang out in the wild. Your group unloads tents, cooking utensils, canned drinks, food ration, torchlight lanterns and other urban comforts from the vehicles and carry them into several narrow motorboats. You get into one of the boats, the Orang Asli guns the outboard engine, and you glide silently upstream for an hour's ride into the heart of the emerald kingdom. You find yourself sitting next to a bird-watcher, who, armed with a pair of $1,400 Leica 10X42 binoculars, points out serpent-crested eagles, pied hornbills and imperial pigeons perched on distant treetops. If she is amiable – the bird-watcher, not the bird – she may even take out her $90 460pp Field Guide to the Birds of West Malaysia and Singapore and flip to the exact page that shows you a detailed drawing of the eagle that you have just glimpsed through her binos. Suddenly the engine is cut and everybody jumps out of the boat into the water. You help carry the burdens of civilisation, wade onto the bank and trudge through bamboo clumps and thick ferns into a spacious clearing which will be your camp site for the night. The place is cool and dark, completely overshadowed by spreading trees. You unroll the light, thin plastic sheet of tent (provided by the tour company), poke the rods through the appropriate places, flip the sheet smartly over and, hey presto! you get a respectable, semi-circular covering that sleeps four people. In front of the clearing is the gurgling river, broken in various parts by mini-waterfalls and circular pools. Everyone changes into swimsuits and treads cautiously down the slippery stone slabs into the water which is chilly despite the warm afternoon sun. You edge yourself to one of the mini-waterfalls and sink your body down as the water splashes onto your shoulders, massaging away the aches and stress of life. Dusk comes with a cover of darkness so deep you see no more than your arm. Battery-powered fluorescent lanterns are switched on and you gather with everyone around to tuck into a restaurant-style dinner of steamed rice and dishes of vegetable, seafood and meat prepared by tour organiser Chris Quek and his colleagues. After dinner, you decline to join a small group taking a stroll into the heart of darkness to do some “birding” (fancy term for watching birds) and, hopefully, to spot a tiger or two. The group returns without meeting any tiger, unfortunately. But you are told they saw fireflies and frogs. Then it’s barbecue time as you gouge on prawns, crabs, fish and chicken wings. Above: The dirt track through an oil palm plantation leads to the Endau River (below) where you load provision and gear onto long, narrow boats for the hour-trip upstream to your jungle camp site.